It's been a really busy week(end) at Casa de Cardigan Junkie. N and I are making our own upholstered headboard, which I'm super excited about, and spending time on that made me think about how much I want to start working on a girly-glam office space after we're done. And since I love decorating in Photoshop, I made a quick mood board as a jumping off point. i love the chair you chose! i think little details can make all the difference (vases, books, lamps, art, rugs). I love that rug! 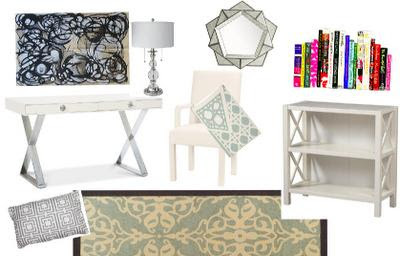 I think rugs are pretty important in a room because they have the power to tie everything together! Books are definitely key, they drive inspiration! The bright books you choose definitely add the color pop you need. The most important piece would probably be the desk, everything else can follow suit. love all the colorful books lined up! they're such a fun and easy way to decorate!